Today's post for Coeliac Awareness week is about a specific skin issue faced by some coeliacs. When I was 20, I woke up one morning with a few small red dots on my arms. Thinking it was probably just an allergic reaction to something, I carried on with my day as a retail sales worker. However, over the next few days these red patches started spreading all over my body. The patches were so streaky and itchy, and developed into blisters. Thinking I was allergic to something in cleaning supplies or something I was coming into contact with at work, I went to my GP and then to my skin specialist, who I had been seeing since I was six years old due to my pseudopelade. They were both baffled, and my skin specialist took the following photos. These are photos of my skin in 2003- my arms, the back of my thighs and my neck. By this stage I had to stop working and I became very depressed. I did not want to leave the house as everyone was staring at me. Even my face was covered in this red blistering rash and I was slathering myself in creams and lotions multiple times a day. Various opinions were sought and ranged from an allergy to pollen, sun exposure, psoriasis and even skin cancer. Interestingly, none of the seven nationwide specialists I saw ever looked at my diet or mentioned that it could be something happening on the inside of my body that was causing this. I even had laser treatment on the patches, which I unfortunately reacted to and therefore could not complete a trial to see if this would help. 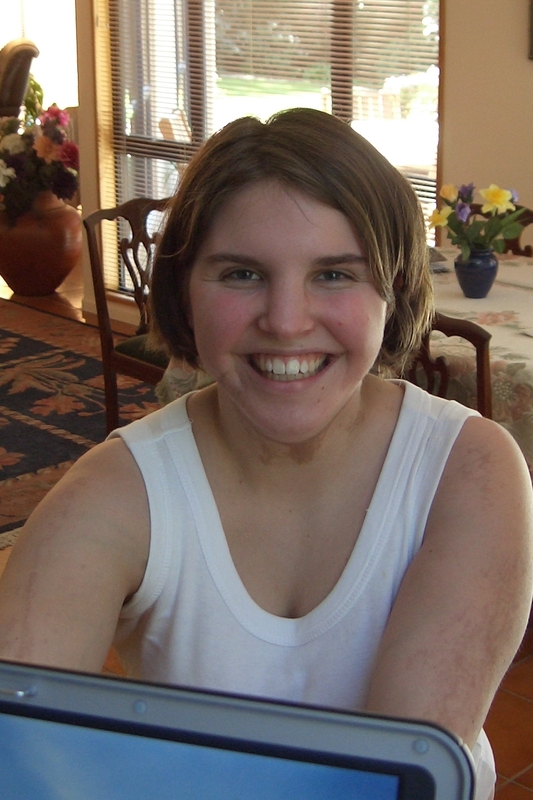 My skin looked like this for a year- red, bleeding, scaly and totally killing my self-esteem. I gained weight as I was just staying at home all day, refusing to go out in public. My original skin specialist suggested Fish Oil capsules as a way to help my body heal, and amazingly over the course of three months the blistering and redness became less apparent. I started to go back to work, and yet I still had a lot of red marks on my face and neck. 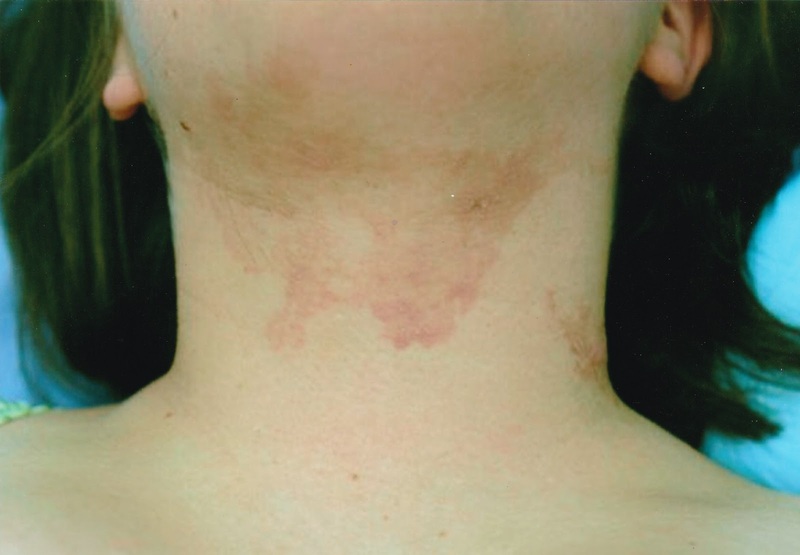 These marks eventually turned into dark pigmented patches all over my body, which I still have 11 years later. You can see from this photo of me just before I turned 22 that the pigmentation was quite apparent and I was still very self conscious. These patches also indented into my skin, so laser therapy and exfoliation are unable to help. Most of the time these patches on my arms and legs are covered up, but I still have a line running from my face down to my neck that is usually covered up with foundation. Here is my neck and face today, without makeup, and you can still see some faint patches of darker and lighter skin. As the years went by, I went back to my skin specialist for a few other issues, and he always checked my skin and made note of how I was progressing to make sure the rash was not coming back. I had always said that the fish oil must have been a factor in the healing, and didn't really think any further of it. Fast forward to this year when I was diagnosed with Coeliac Disease. When the dietitian asked me about any skin issues, this story came to light and she had a look at my rash then made some notes. After my gastroenterologist diagnosed me, I went back to his office to discuss the implications and my new diet. 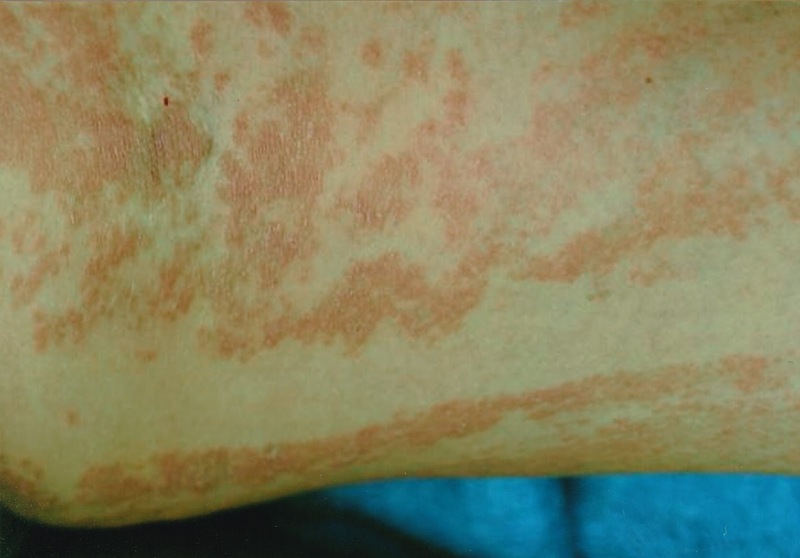 He mentioned that I had obviously experienced a severe case of Dermatitis Herpetiformis, a common skin condition affecting 15-25% of people with coeliac disease. I went home and googled this, and I immediately burst into tears when I saw the information about it and the subsequent photos. Reading the symptoms I felt like a huge weight had been lifted off my shoulders. It was so good to finally have a diagnosis and a reason why my skin did this. 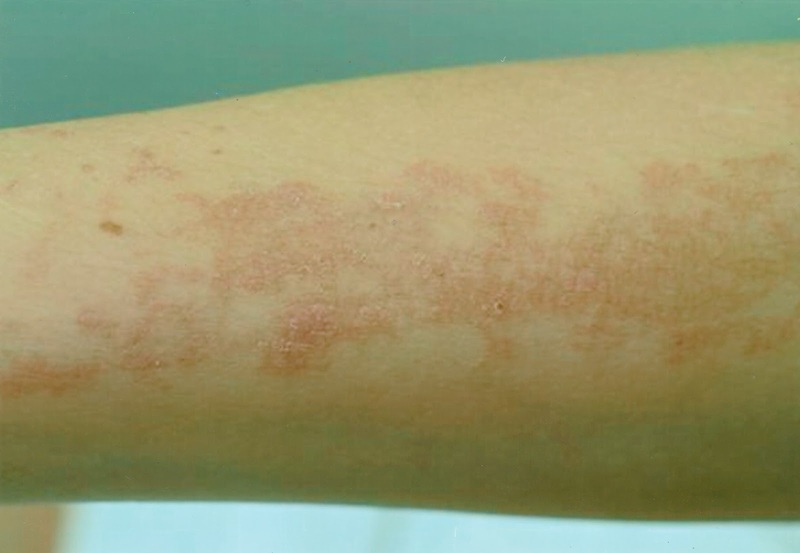 Dermatitis Herpetiformis is a gluten related non-viral, genetic skin condition that usually occurs in adulthood and is more common in men than women. A gluten free diet is the only way to treat it along with topical creams for the itching and blisters. The lesions leave hyperpigmentation and in my case, some scarring also. It is also linked to hair loss, which I have, and can also be linked to other genetic disorders. I also found that I had some eczema patches flaring up on the back of my neck and my right eyelid, so changing my skincare, makeup and shampoo has been a huge help. You wouldn't believe how many things in our everyday life contain gluten, even if we aren't consuming it! These days, I use an organic shampoo and I recently discovered the gluten free line of skincare products from Nutrimetics, which I am excited about! My skin is definitely a reflection of what is going on in the inside of my body, and I need to be careful about what goes on my body as well as in it. I even have reactions to homemade playdough, and a lot of symptoms I thought were due to my cleaning products are actually from me coming into contact with flour when I bake for my children. I would love to hear from anyone else who has experienced Dermatitis Herpetiformis, or has other skin issues relating to Coeliac Disease. I have struggled with my skin since I was very young, and having an answer makes me feel like I can move forward with my life and help others who experience this skin condition. Hi Laureen, this rash is how my partner and son were diagnosed coeliac's. It certainly is a terrible rash. So pleased you found the cause. Hey firstly thanks for sharing your story. I can definitely to relate to how it feels being stared at by strangers. I don't have Coeliac disease but I do have some digestion problems when I eat processed foods and my dermatologist and geneticist says its related to my ichthyosis - a totally different condition to yours, I know, but it was a relief to know that I didn't just develop another condition. Since eliminating bread from the supermarket and chips and cheap cakes etc, my tummy feels much better. Funnily, my skin didn't worsen from the foods, it was just that my tummy became bloated and upset. Thanks for writing! You have a beautiful smile! It might have taken a while, but I'm so glad you have an answer! How frustrating that must have been.